Your security level permissions define your access to the Agent Browser tools. Refer to Security levels. The Datto RMM Agent Browser allows you to connect to a remote device and execute a variety of actions on it. This topic will explain the function of the Agent Browser tools that are at your disposal once the connection to a device has been established. While the Agent Browser is only available for Managed Agents on Microsoft Windows devices, the Agent Browser can connect to Managed and OnDemand devices, on Windows, macOS, and Linux operating systems, with varying options available to each. You can also initiate a browser connection, a direct connection, or a custom tunnel connection to devices managed by a network node device. Refer to List of Agent Browser tools. The Agent Browser is only available for Managed Agents on Microsoft Windows devices. OnDemand Agents and operating systems other than Windows do not have an Agent Browser. For information on how to install the Agent on Windows devices, refer to Install or uninstall the Windows Agent. Log into the Agent Browser and search for the device you would like to connect to. For more information, refer to Log into the Agent Browser and Connect to a device. Once the connection has been established, collapse the Search area and click on the device in the Connected Devices section. This will activate the Agent Browser tools available for the device on the left of the screen and the device Summary page on the right of the screen. You can specify in the Agent Browser settings if the connected device should be selected automatically in order to activate the Agent Browser tools. Refer to Configure the Agent and Agent Browser. The Summary page will display the Agent version installed on the device and basic information including hostname, description, site name, domain, IP address, and more. You can refresh the information by clicking on the Refresh button in the top right corner and you can mark this device as a Favorite in the top left corner. Network devices and printers show limited information. Clicking on a tool on the left of the screen will open it on the right of the screen, next to Summary. You can have multiple tools open at the same time. You can navigate between the tabs by clicking on their name or by choosing them from the drop-down in the top right corner. You can close each tab by clicking on X in the top right corner of the tab. You can open the tools by clicking on their icon on the left of the screen or by clicking on the Tools menu in the menu bar and selecting the required tools. Double-click on any tab or drag and drop it to break it out into a separate window. These windows can then be arranged on your screen as required. Drag a tab and drop it on the top, bottom, left or right of the screen to dock it. Once a tab is docked, you can auto-hide it by clicking on the Auto-Hide icon in the top right corner. This will hide your tab. Hover over the tab to expand it and click on the Auto-Hide icon to dock it again. Your security level permissions control which tools you have access to. Refer to Security Level Details - Agent Browser Tools. The tables below display the list of available Agent Browser tools, depending on the device type you are connecting to. Context menu Click the context menu and select a device shortcut to open that specific page in the Web Portal. For information about the available shortcuts, refer to Context menu. You must have correct security level permissions to the Web Portal to access these shortcuts. Refer to Security Level Details - Permissions. Thumbnail Screen Thumbnail image of the device you are connecting to. Takes a screenshot of the remote device. Save the image by clicking on the Save icon in the top left corner above the image. Screenshots can only be taken on the main monitor. 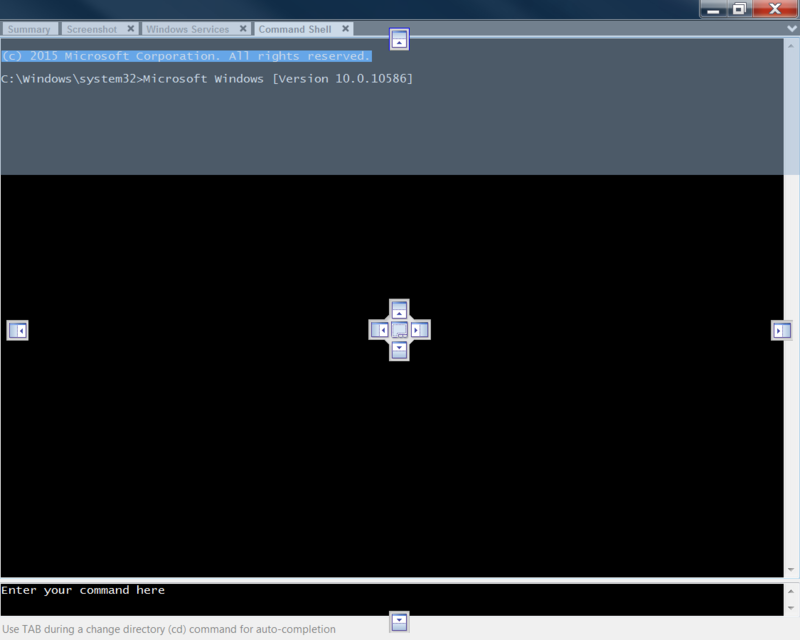 Command Shell Opens a command shell on the remote device where you can enter your commands. PowerShell Click the arrow next to the Command Shell icon to access this option. It allows you to connect to a full PowerShell interface on the remote device to execute PowerShell commands. Multiple connections can be opened to the same endpoint, and multiple different PowerShell connections can be open at the same time. PowerShell 2.0 and later versions are supported. The PowerShell connection requires authentication much like an RDP connection. You need administrator credentials to establish the connection. If the remote device has saved RDP credentials, those will be used for the PowerShell connection as well. Once a connection has been established, the title of the PowerShell window will display the hostname of the remote device. If you encounter the error message "Login or password is invalid" even when using Windows/domain administrator credentials, this could be because Powershell Remoting is disabled by default on the remote device. This can be resolved by running the PowerShell command Enable-PSRemoting on the remote device. Agent Deployment Allows you to deploy the Datto RMM Agent to devices on the remote network. For more information, refer to LAN deployment using the Agent Browser (Windows only). • Select a process and kill it by clicking on the End Process icon in the top left corner of the screen. • Highlight a process in the CPU area and click the Search Online button in the top left corner of the screen. It will perform a Google search on the selected process. You can have a quick look at the CPU and memory usage of the remote device next to the thumbnail image of the device on the left of the screen just above the Agent Browser tool icons. The red bar indicates the CPU usage and the blue bar indicates the memory usage. Click on the pause button above the bars to pause the feedback on these pieces of information temporarily. • Download item(s)... - Select any file or folder on the remote device and click Download item(s)... In the pop-up window, select where you would like the item(s) to be saved on your device. • Upload files... - Navigate to a location on the remote device where you would like to upload your file(s) to. Click Upload files..., and select one or more files from your device to upload them to the remote device. • Copy to my desktop - Select any file or folder on the remote device and click Copy to my desktop. It will copy the selected item(s) to the desktop of your device. • Copy - Select any file or folder on the remote device, click Copy, and then paste the item(s) to another location on the remote device. You can also copy the item(s) by using the Ctrl+C combination on your keyboard, or by right-clicking on the item(s) and selecting Copy. • Cut - Select any file or folder on the remote device, click Cut, and then paste the item(s) to another location on the remote device. You can also cut the item(s) by using the Ctrl+X combination on your keyboard, or by right-clicking on the item(s) and selecting Cut. • Paste - Copy or cut any file or folder on the remote device, and then click Paste to copy or move the item(s) to another location on the remote device. You can also paste the item(s) by using the Ctrl+V combination on your keyboard, or by right-clicking on the item(s) and selecting Paste. • New Folder - Navigate to a location on the remote device where you would like to add a new folder and click New Folder, or use the right-click menu and select New Folder. • Edit Name - Select a file or folder and click Edit Name, or right-click on the item and select Edit Name. This will allow you to rename the item. You can only rename one item at a time. 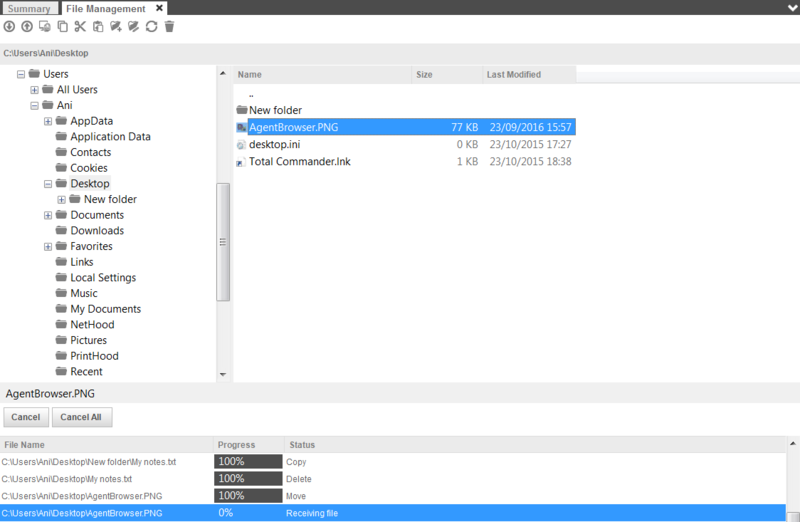 • Refresh - Refreshes the current view of the files and folders of the remote device. • Delete - Select any file or folder on the remote device and click Delete to permanently delete the selected item(s). You can also use the Delete key on your keyboard, or right-click on the item(s) and select Delete. When an action cannot be performed on the selected item(s) or in the selected location, the corresponding button and right-click option is disabled. • Drag and drop any file or folder from your device to the remote device. • Sort the files and folders of the remote device by Name, Size, and Last Modified date by clicking on any of the column headers. • Follow up on the progress of file transfer and management below the file and folder structure of the remote device. You can also cancel any or all actions by clicking on Cancel or Cancel All. Registry Editor Allows you to add and edit registry items on the remote device. Quick Jobs Allows you to run quick jobs on the remote device. Click on Execute Job to run the component or application as a quick job. For more information, refer to Quick jobs. Event Viewer Allows you to view the event logs on the remote device. Wake Up Allows you to wake up devices that are in the same site and subnet as the device you are connected to. For more information, refer to Wake-on-LAN. Drive Information Allows you to view the following information about the current local drives of the remote device: Name, Drive, Type, Size, Free, File System, % (percentage used). Click on any of the column headers to sort the information by that column. • To add a network drive, click on the plus sign in the Mapped Drives area and specify the following drive settings: Drive Letter, Folder, select if the end user should use their current credentials, be prompted for credentials on use, or connect as a different user. • To remove a network drive, select the drive in the Mapped Drives area and click on the minus sign. The changes will be applied when the end user next logs onto the remote device. The Operations Log area will display details on your drive mapping operations. Right-click anywhere in the Operations Log area and click Clear to delete all of the log entries. 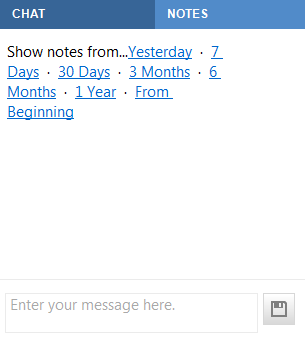 Sort the log information by clicking on any of the column headers: Time, Operation, Drive, User, Message, Action. Shut Down Allows you to shut down the device. Click on the arrow next to the icon to access both the Shut down and the Restart tools. Restart Allows you to restart the device. You can access it by clicking on the arrow next to the Shut down icon. SNMP Test Tool Only available if the device you are connected to is a network node device. It allows you to test network devices using SNMP. 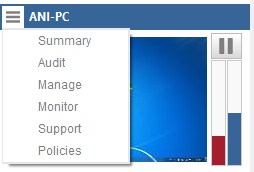 For more information, refer to Test SNMP monitoring in the Agent Browser. VNC Opens a Virtual Network Computing (VNC) shared screen session on the remote device. Click on the icon to share the remote user's desktop, mouse and keyboard. VNC does not allow user switching and will not be able to connect to a device where no user is logged in. If connecting to a remote user's device running Mojave (macOS), a pop-up notification displays stating AEM Agent.app would like to control this computer using accessibility features. Direct the user to click Open System Preferences on the device and then to select the application in the Privacy pane in order to allow interaction between their device and the Agent's VNC session using Vine Server. Please note that Vine Server is installed during the Agent install and runs as user (instead of root) so that the above permission can take effect. 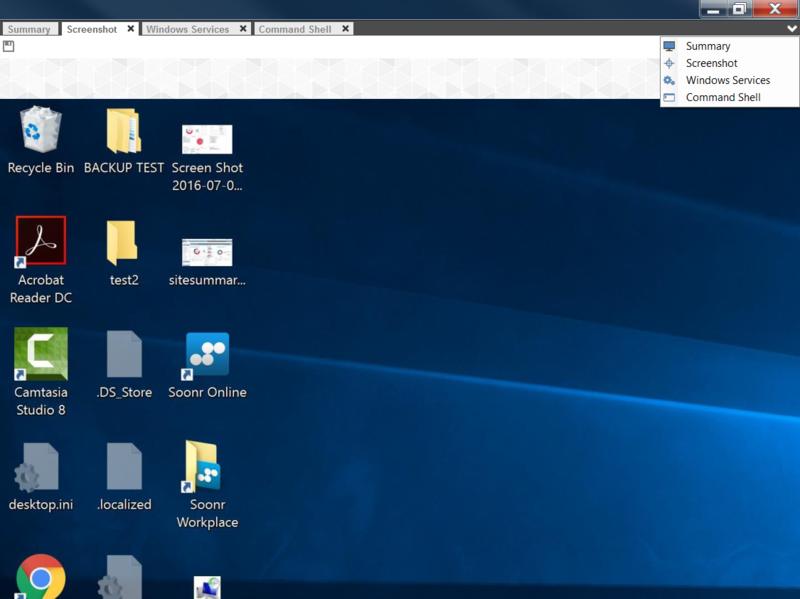 If you would like to open a VNC session without the ability to control the remote device, click on the arrow next to the VNC icon and click Connect in View Only Mode. If connecting to a remote user's device in View Only Mode, a pop-up notification will display to the user that their machine is being accessed, even though you are not actually taking control of the device. There is no way to prevent this notification from displaying. To learn how to configure your VNC remote takeover settings, refer to Configure the Agent and Agent Browser. 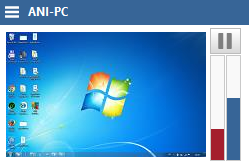 RDP Opens a Remote Desktop Protocol (RDP) session when clicking on the icon. RDP will create a new desktop on the remote device, i.e. it will create a separate (not shared) session and will prompt you to log in. If you would like to see what is shown on the remote device's screen using RDP, click on the arrow next to the RDP icon and click Connect to Console Session. To learn how to configure your RDP remote takeover settings, refer to Configure the Agent and Agent Browser. For information about Network Level Authentication in RDP sessions, refer to Network Level Authentication. Splashtop Opens a remote takeover session via Splashtop. For further information, refer to Splashtop Remote Screen Share Integration. You can use any of the network control tools listed below to connect to Windows, macOS, and Linux devices, ESXi hosts, network devices, and printers. Connect (HTTP) This option lets you set up a browser connection to any managed device in Datto RMM. The device's network node will be used to set up the connection without the need of a VPN or any additional tool. Multiple simultaneous sessions can be open at the same time. • Hostname - The name of the device you are connected to in the Agent Browser. • Description - The description of the device you are connected to in the Agent Browser. • IP address - The IP address of the device you are connected to in the Agent Browser. It is automatically filled in but you can edit it to enter a port number if necessary (e.g. 192.168.1.3:8080). • Connection type - Select HTTP or HTTPS from the drop-down list. HTTP is selected by default. • Open browser automatically after successful connection - Select the check box to apply this setting. If the connection is initiated from the Agent Browser, this setting is OFF by default. However, if the connection is initiated from the Web Portal, this setting is ON by default. • Start connection automatically next time - Select the check box to apply this setting. If the connection is initiated from the Agent Browser, this setting is OFF by default. However, if the connection is initiated from the Web Portal, this setting is ON by default. • Network Node - Shows the network node that is used to establish the connection. • Status - Displays the status as per the log details. Once the status is active, a clickable URL will be displayed based on the selected connection type and the IP address and port information (e.g. https://192.168.1.3:8080). • Start/Stop - Allows you to start or stop the connection. • Save Defaults - Click to save the current settings as default settings for future connections for this device. • Logging - Displays the activity log. This tool uses a proxy auto-config (PAC) file to automatically configure your browser. The PAC file allows your browser to use a different proxy server when connecting to your target devices, as opposed to other Internet sites. It only overrides the way the connection is established with these particular devices, while the rest of the Internet is accessed using the default connection method. The PAC file is hosted inside the Agent Service and is activated either automatically at user logon or when starting an HTTP/S session. When you click the Start button to initiate the connection from within the Agent Browser, a dialog box appears to let you decide when you want the proxy settings to be applied. The dialog box also lets you set the activation method to automatic by selecting the Never ask again check box. If you click Yes, the Agent will activate the embedded PAC server at user logon. This will have no impact on your browser and Internet performance. If you click No, not now, the embedded PAC server will be launched when the first session is started and stopped when the last session is stopped, after which the original proxy settings will be restored. Please note that with this approach, your browser may need to be restarted to apply the proxy configuration changes. For the best user experience, we recommend setting Google Chrome as your default browser. Connect (Telnet/SSH) This option lets you connect to the terminal interface of any managed device in Datto RMM. The device's network node will be used to set up the connection through PuTTY. Once the connection is established, Datto RMM will launch the remote shell. • URL and port number - The IP address of the device you are connected to in the Agent Browser and port number 22 are automatically filled in. You can edit these details. • Connection Type - Select SSH or Telnet. SSH is selected by default. • Open PuTTY automatically after successful connection - Select the check box to apply this setting. If the connection is initiated from the Agent Browser, this setting is OFF by default. However, if the connection is initiated from the Web Portal, this setting is ON by default. When an SSH connection is initiated and the target device is used as a network node, the network node's Privacy Mode settings will be respected. Refer to Privacy Mode. • Status - Displays the status as per the log details. Connect (Custom Tunnel) This option lets you use any application directly on any device. 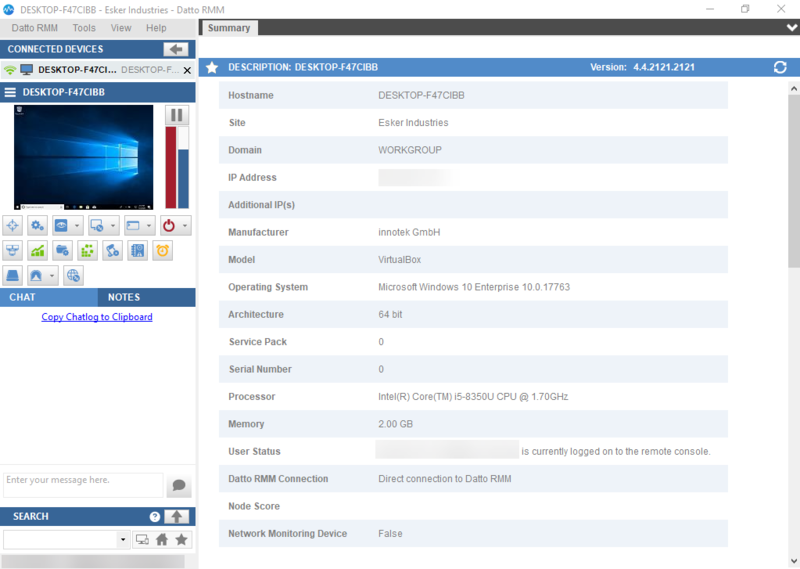 A common use case is using a third-party management console on a Windows Device. • URL and port number - The IP address of the device you are connected to in the Agent Browser and port number 1 are automatically filled in. You can edit these details. • After connected, run the following command - Select the check box to apply this setting, and enter a command you would like to run on the device. This setting is OFF by default. • Start connection automatically next time - Select the check box to apply this setting. This setting is OFF by default. RDP connections made via the Agent's Custom Tunnelling feature will not respect the Agent's Privacy Mode setting. Users will still be required to enter the Username and Password of the device they are connecting to. Chat Send messages to the end user of the connected device. Enter your message and hit Enter or click the chat icon . It will display a chat window on the endpoint and the end user will be able to reply to the message. 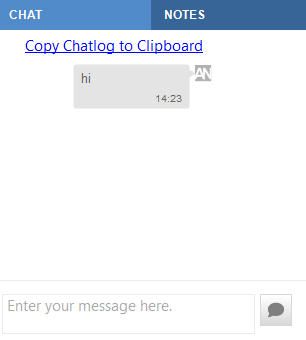 You can click the Copy Chatlog to Clipboard button to copy the conversation. This button will not appear in the chat window of the connected device. You can specify in the Agent Browser settings if you want to play a sound when you receive a new chat message. Refer to Configure the Agent and Agent Browser. Any note added here will be visible in the Notes section on the Device Summary page. Refer to Device Summary. Notes will also be visible in the Device Activity Report. Refer to Device Activity. You can also add a note when closing the connection to a device. For more information, refer to Disconnect from a device.